North Korea appears to be set to remove peace from the earth. 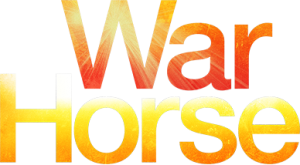 While all eyes are watching the ‘red’ nation that possibly is Revelation’s red horse, the second horse, another horse is being saddled – the white horse that rides first. North Korea may or may not represent the ‘red’ horse nation that rides forth after the white horse. China and Russia may also fit. However, preparations are being made for the white horse to ride and conquer the Middle East and then the entire earth. US Defense Secretary James Mattis and Egypt’s President Abdul-Fatteh Al-Sisi both made strategic visits to different Middle East capitals this week. Mattis arrived in Djibouti City, capital of the Republic of Djibouti, on Sunday, April 23, 2017, while El-Sisi landed in Saudi Arabia’s capital, Riyadh. Both capitals are pivotal for the Arab face-off with Iran for control of the strategic Red Sea. The Republic of Djibouti is located in the Horn of Africa. It is bordered by Eritrea in the north, Ethiopia in the west and south, and Somalia in the southeast. The remainder of the border is formed by the Red Sea and the Gulf of Aden at the east. These countries, along with South Sudan, Somalia, Kenya, Uganda, Central African Republic and Chad were all inclusive in Biblical times as “Ethiopia”. 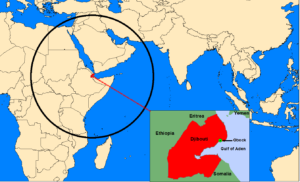 Look at the map to see that modern Djibouti is at the choke point to the Red Sea. This area is the Tiran Strait. Djibouti’s location is of great military strategic importance in the event of war with Iran. America’s only African base is at Camp Lemonnier, the former French colony that is located on the Bab el-Mandeb Strait between Djibouti and Yemen that is a springboard for offensive US operations against Al Qaeda jihadists (AQAP) in Yemen and Somalia. He who controls this strait, controls the Middle East. In Biblical times, Djibouti was part of Ethiopia which will be conquered by Revelation’s white horse conqueror. The king of the north is the coalition of Iran, Iraq, Syria and Hezbollah backed by Russia. The king of the south is the coalition of Saudi Arabia, Israel (yes, Israel is aligning with Saudi Arabia), Egypt, Jordan and about 3 dozen other Arab nations backed by the US. These are now facing off with each other. The battle lines are being drawn and the Red Sea has become pivotal to both warring parties. The Gulf of Aqaba, which is the eastern-most finger of the Red Sea, controls all imports into the Middle East. Ships dock at Aqaba, Jordan on the east side and Eilat, Israel on the west side. The Red Sea is Jordan’s only important asset. Jordan has no oil, but what it does have is the strategic port of Aqaba. He who controls that, controls the Middle East. The trigger for the Great Tribulation will be the Gog-Magog war. A coalition of nations led by the United States will attack Israel to enforce peace between the Israel government and the Palestinian Authority. The last situation Iran will tolerate is the US perched in Israel. This war will be answered by the king of the north. “The Red Sea is an essential component of Egypt’s national security. Egyptian President El-Sisi recently sent Saudi King Salman an offer of 40,000 Egyptian troops to man the kingdom’s southern border against Iranian-backed Yemeni Houthi insurgent attacks. King Salman turned down the Egyptian offer for Egyptian troops on Saudi soil because he would rather see them fighting Iran’s proxy troops, the Houthis, in Yemen alongside Saudi and United Arab Emirate troops. These troops (including a large number of Sudanese and Colombian mercenaries) are now engaged in a drive to capture the port of Hudaydah on the eastern Red Sea coast of Yemen to keep it out of Iran’s control. Take note of how the king of the north has begun to encompass the king of the south. Iran has troops in Iraq and Syria in the north and Yemen in the south. Saudi Arabia has troops in Yemen, too. Now, Iran is starting the fight for control of the Red Sea. A major battle may ensue between Iran and the United States at the Tiran Strait. Iran and its coalition members will take control of the Red Sea by sweeping southwest through Israel and into Egypt and Ethiopia, and southeast into northern Jordan and Saudi Arabia. Iran’s proxy troops, the Houthis in Yemen, will help to secure Saudi Arabia southern border. Iran will gain control of both fingers of the Red Sea, including the Gulf of Aqaba. “Djibouti’s Defense Minister Ali Hasan Bahdon said Djibouti is cooperating with Riyadh to monitor any military intervention or weapons smuggling from Iran to Yemen as well as Oman to Somali coastal area through Yemeni waters. Djibouti and Riyadh signed a military agreement for cooperation and military defense. Saudi Arabia announced this week that Houthi rebels had attempted to bomb an Aramco oil distribution terminal at the Red Sea coast near Jizan which borders Yemen. The Shiite militia used an unmanned speedboat packed with explosives and headed toward Jizan. It was spotted by the Saudi Coast Guard which fired at the vessel’s engine, stopping it before it could reach the terminal. WesternJournalism.com just explained and confirmed, in secular terms, what the Bible says. There is a war between two Middle Eastern coalitions. The United States and Russia have each backed a side. It looks like the king of the north coalition is outnumbered, but the Book of Daniel describes how this outnumbered coalition overruns the king of the south coalition. 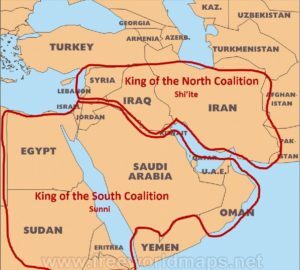 The king of the north coalition is not on the move only around the Red Sea and Saudi Arabia. This week, the king of the north also moved against Israel. “Early Thursday, April 26, a mixed Syrian-Iranian-Hizballah force embarked on a general offensive in southern Syria ready for a leap on Israel’s Golan border. They moved forward in the face of Israeli warnings that were relayed from Moscow to Tehran and Hizballah. This latest warning was issued by Defense Minister Avigdor Lieberman, who is visiting the Russian capital this week to attend an international security conference. After meeting Russian Foreign Minister Sergey Lavrov and Defense Minister Gen. Sergey Shogun, the Israeli minister stated clearly on Wednesday: “Israel will not allow the concentration of Iranian and Hizballah forces on its Golan border.” By Thursday morning, it was evident that a decision had been taken in Moscow, Tehran, Damascus and Beirut to ignore Lieberman’s warning. DEBKAfile’s military sources report that early Thursday, Shiite militias under the command of Iranian Revolutionary Guards officers, alongside Hizballah troops, organized as the Southern Shield Brigade, launched their offensive at Mt. Hermon southwest of Damascus, on their way to the Syrian-Israeli Golan border in the region of Quneitra. The Syrian contingents taking part in this push are the Syrian army’s elite 42nd Brigade and elements of the 4th Mechanized Division. Iran views Israel and the US as the world’s greatest enemies. The Sunni Arab states are not far behind. Now that Israel is aligned with the Sunni king of the south coalition, Iran’s ire is greatly increased. This Sunni alignment also raises Iran’s anger toward the United States. All out war is next on the global table. The global war will begin in the Middle East, but will quickly spread to the western hemisphere where North Americans will all be in grave danger. The first horse of the Book of Revelation to ride is the white one who is given a crown. This horse is given a crown because it is a ‘coalition horse’ with a “king”, the nation of Iran who is backed by Russia. He rides forth to conquer. This is the Shi’ite horse, the king of the north coalition horse led by Iran, riding forth to conquer the king of the south, Saudi Arabia and the other Sunni states. The Gog-Magog war will trigger the Great Tribulation, but in quick succession after it starts, the white horse will ride, sweeping west of the mountains that separate Israel and Jordan to conquer Israel, Egypt and Ethiopia (Sudan, Eritrea and the much coveted Djibouti on the Red Sea at the Tiran Strait). The king of the north will also sweep along the east side of the mountains to conquer northern Jordan and the area Jeremiah calls “the swelling of Jordan” (Jer 49:19, Jer 50:44 ). The Sunni nations will be brought under Shi’ite imperialism and the earth will experience the change in global government attempted by Barak Obama which failed because he was unable to unite the Islamic nations under Sunni Islam. The 2nd horse to ride is the red one which could be any of the ‘red’ nations – China, North Korea, Russia or the ASEAN coalition of Asian nations that may join with the others. This should tell us that war with any of the ‘red’ nations – North Korea, China, or any of the Asian nations and Russa – will follow the Shi’ite battle for supremacy in the Middle East. The world will topple into global war. President Donald Trump, a thuggish business man with no military experience who is bringing his big hammer to the world’s war table, is gambling in the arenas from where the first two horses of Revelation ride: The Middle East and the Far East. Will it be now or later? Only YHVH knows, but we can be sure that another step has been taken in the direction of the Great Tribulation. Good luck to you, sir. And good luck to all of earth’s inhabitants.